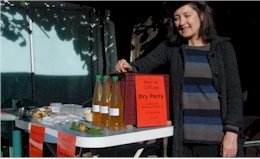 Cottage perrymaking, fruit pressing, single variety perry for sale. An abundance of fruit and nut trees and hedges of edible berries in our replanted orchards. Bring a picnic to our meadow overlooking the panoramic view to the Malvern Hills and beyond. 12noon and 2.30pm Our edible hedges. Guided tours of young fruit and nut groves and edible hedges which re-establish our field pattern. 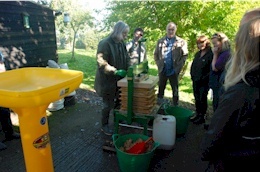 3.30pm High altitude cider tasting Pop-up tutored tasting with a view, with Ciderologist Gabe Cook. Our local pubs and restaurants often serve dishes using apple and cider recipes. Booking advisable . The celebration of English apples, cider and orchards in the Herefordshire parishes of the Marcle Ridge. The name ‘Big Apple’ as a festival is registered with the Intellectual Property Office.